Over the years, Metroidvania inspired a large number of indie studios wishing to add their personal touch in order to stand out while respecting the essence of the game genre. If some titles such as Guacamelee or Hollow Knight managed to grab the hearts of the players, it’s starting to become a bit difficult to stand out in the style. Sadly that is is the case of Nightmare Boy, which despite an attracting visual identity, struggles a bit to make a difference in the Metroidvania genre. Nightmare Boy’s story begins with Billy, a little boy heading to sleep for the night without much of a backstory, when a monster comes out of nowhere. This monster named Balder is none other than the so-called king of a parallel world who is looking for someone to replace the prince of nightmare, in order to reach his end and thus win the queen’s heart. Refusing to accept his request, Billy gets tossed into the land of nightmares and dreams known as Donorok. Now you have to go through this new nightmarish world and discover the secrets in order to have a chance to get ahead of your enemy, and hopefully wake up to reality. In any case, without being groundbreaking, the script is neat and easy to understand. The game is based on a very progressive gameplay with a rudimentary set of upgrades in the beginning. If you were hoping to get a feel for the level design from the beginning, then you’ll be disappointed, as the Nightmare Boy clearly opens up its doors based on your upgrades. You will start from nothing with a simple jump and basic melee attack, to eventually get triple jump, a fireball, some ally ghost to help you, and eventually get access to new areas and cross new obstacles to discover new parts of Donorok. And like any self-respecting Metroidvania you will sometimes have to go back as far as the beginning of the game, to find a passage that was not accessible at the start, leading you to a new obstacle that you will have to overcome thanks to a new power, and continuing the cycle. The exploration of the world will lead you to meet other children who are also prisoners in this kingdom, which once released will thank you by offering a new ability. It will be essential to explore each corner of the map to get all the skills necessary and progress in the best conditions. Note that also each enemy killed will give you gems that are crucial to “buy” your save, but also get some new skills from sellers. If the title takes advantage of a rather pleasant artistic direction, it struggles to stand out from the competition with overall backgrounds and level designs. The bosses are also far from achieving the sort of appealing trait of the genre, with a rather bland design, using crude patterns, with a disconcerting simplicity. If their design isn’t as great as you’d expect, the challenge is also a bit easy, and I wished it was more frenetic and exhilarating overall. Thankfully, the difficulty gets a little more present in the latter stages of the game, with attack patterns that are a bit more complex, but in the end the gameplay will never reach the heights of other known metroidvania. Finally, I think the most important weakness of Nightmare Boy is its lifespan, which is easily achieved in less than 5 hours. While other Metroidvania can easily take 15-20 hours to finish, you’ll soon realize that this world is quite limited in size and exploration, with simple platforming stages, and a rather rare amount of verticality in therms of level design, but then again you are paying 10$. Nightmare Boy was reviewed using an Xbox One downloadable code provided by BadLand Games. The game is also available on Xbox One, PlayStation 4 and PC via Steam. We don’t discuss review scores with publishers or developers prior to the review being published. 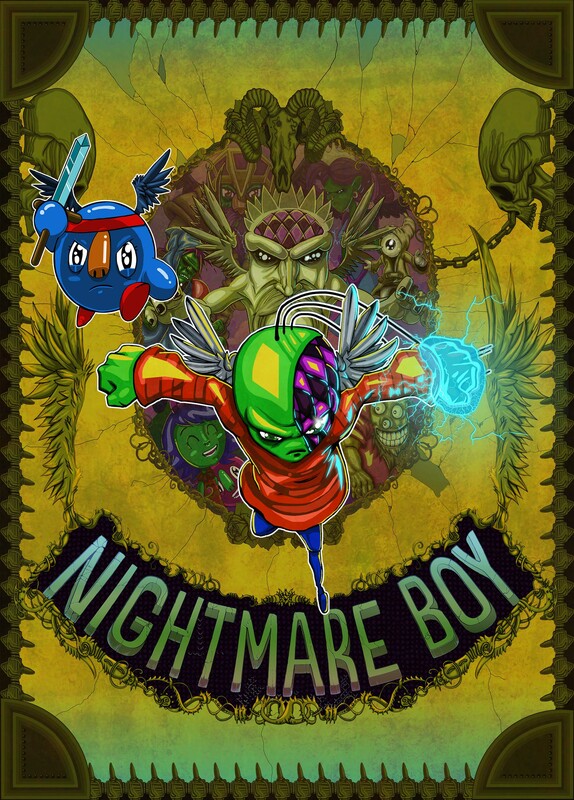 Without being the perfect Metroidvania, Nightmare Boy is still a good affordable title, with a fun story and simple gameplay mechanics to appeal to the genre newcomers.